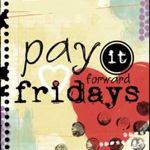 So a little late, but it is Pay It Forward Fridays again!!!! Ugh Pam, hope this week's better for you. Thank you Karen, will look forward to you playing next week.